Niantic has announced a new feature for Pokémon Go called GO Snapshot which allows players to take a photo of any Pokémon they have in their Pokémon Storage. Snap off the lens cap on your inner photographer! Trainers, We’ve been inspired by the photos you’ve taken with our AR+ feature. From the smallest Wurmple to the tallest Alolan Exeggutor, Trainers have taken amazing photos that show off Pokémon in their natural habitats. Today, we’re happy to announce that a brand-new feature will arrive soon—one that’s sure to make capturing the charms of your favorite Pokémon easier than ever! Introducing GO Snapshot—an easy way to take a photo of any Pokémon you have in your Pokémon Storage! You can find the feature when looking at a specific Pokémon or accessing the camera in your Bag of items. It’s simple to use. Select a Pokémon and tap on the screen to throw its Poké Ball to that spot. Once your Pokémon is situated in the ideal spot, you can then move around it to find the best angle for your photo. Is your Pokémon distracted or looking the wrong way? Brush across it to get its attention, and it will be sure to face you. Take as many photos as you like during your session. Once you’re finished, all photos are saved to your device automatically! It’s also easier than ever to share your favorite photo via social media. Just select the linked social channel you want to share with, and you can show your friends your masterpiece with a couple of quick taps. 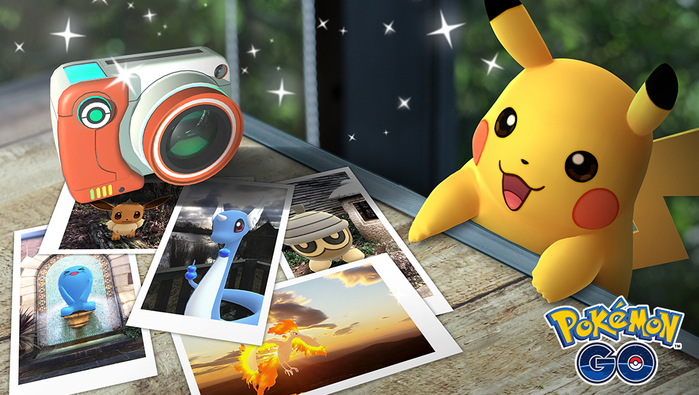 We can’t wait to see the amazing photos you’ll take of your Pokémon! Don’t forget to send us your works of art with #GOsnapshot, so we can show them off, too! Let’s grab our cameras and GO!